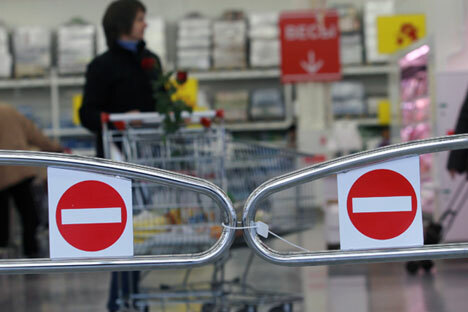 Russian food security regulators carry on intensive checks of the French Auchan hypermarket network, which ranks third by revenue amongst food retailers in Russia. Rospotrebnadzor is inspecting all Auchan stores in Moscow, Rospotrebnadzor head, chief Russian public health official Anna Popova said on Aug. 19. "The Rospotrebnadzor department in Moscow launched a systemic all-inclusive scheduled check in all Auchan stores in Moscow in the middle of June, including five large stores and the others that are deemed to be smaller," she said. Documents on the inspection outcomes are now being drawn up, Popova said. "We are not in the habit of publishing inspection results until it [the inspection] is over," she pointed out. Rosselkhoznadzor said on Aug. 19 that the Auchan Kuntsevo hypermarket at 19/1, Yartsevskaya Street had committed similar violations as the four hypermarkets checked earlier, i.e. non-compliance with veterinarian-sanitary treatment and equipment disinfection requirements in its uncooked product shop. A fact of biological waste storing in solid household waste disposal sites has been established. Systematic violations demonstrate that the Hazard Analysis and Critical Control Points (HACCP) appraisal system applied by the French retailer is not efficient and not functioning well enough as it does not assess risks in meat processing, Rosselkhoznadzor said. The service will test meat product samples, analyze documents submitted by Auchan and release an inspection report. Rosselkhoznadzor had said that it would go to court to force Auchan to stop making uncooked meat products. Listeria was found when testing four Auchan hypermarkets in Moscow and the Moscow region, in addition to an excessive amount of coliform bacteria, aerobic mesophilic and optionally anaerobic organisms. Rosselkhoznadzor also found pork, chicken and sheep DNA in ground beef (which was not indicated on the label); cattle, chicken and sheep DNA in ground pork; and pork, cattle and sheep DNA in uncooked kebabs made from beef and lamb. Out-of-date sausages were used when cooking pizzas at one of the Auchan hypermarkets and out-of-date meat was sold there, the service said. Auchan partially agreed with some of Rosselkhoznadzor's charges, but dismissed other complaints and intends to challenge them. In particular, this concerns control over bio-products that is exercised by state veterinarians at logistics centers and hypermarkets upon entry and disposal of written-off bio-products. The company also demanded that the watchdog withdraw its claim on discovering horse DNA in ground pork, insisting that it does not use horsemeat in its products. The Auchan situation has caught the attention of France. The French Embassy in Russia has recently asked Rosselkhoznadzor to explain the inspections of the retail network. The Embassy did not express concern but simply asked for the provision of inspection details, the Embassy press service said. The French retailer Auchan arrived on the Russian market in 2002. As of the end of last year, the company operated 84 stores in Russia, among them 55 classic hypermarkets, 23 Auchan City hypermarkets and six Nasha Raduga hypermarkets. Auchan LLC posted a 313.6 billion ruble revenue and an 11.9 billion ruble net profit in 2014 (according to the SPARK-Interfax database).